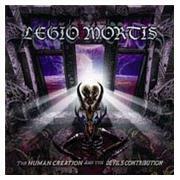 German band LEGIO MORTIS have been around for ten years, and three releases including this CD. Their brand of dark/death metal is this time around mastered and mixed by Alexander Krull of ATROCITY and LEAVES EYES. The vocals are augmented by Liv Kristine of LEAVES EYES in the song “Life Denied” as well. This lot has supported the likes of NILE and BLACK LABEL SOCIETY, and seems to be something of a house band at Metalfest Germany, so I guess I have expectations. The opener “Intro” is a combination of an air raid siren and some monstrous grunts. The real opener “Unholy Four” is a heavy piece framed by a choir and some beautiful keys. The keyboard work is actually a stunner throughout. On the stunner side I count “Mass Murder” and the Liv Kristine sung “Life Denied”. The album has very clear ups and downs to me, they almost comes in twos! There are touches of symphonic black metal, frantic openings with high velocity instrumental parts. There are clean guitar parts to contrast against the hissed or grunted vocals. The vocals are almost a pain in the proverbial. The drum sound is not to my liking, too smattering and light at the same time. e proverbial to muster at times. At times the vocals are almost in the KING DIAMOND vein, e.g. “Mass Murder” and “Blood Fantasy”. As a whole it is a mixed bag to me. And mixed is the mark.